I first started watching “Fresh Off the Boat” because I had read Eddie Huang’s memoir of the same name, which loosely inspired the show. The TV version follows the Huangs, a Taiwanese American family, growing up in Orlando, Florida, in the 1990s. What I love about the show is that it reflected some of the experiences I had growing up, such as the scene in the pilot episode where Eddie wants to fit in with his classmates and bring Lunchables to school, because they mocked his homemade noodles. Before that, I hadn’t really seen accurate portrayals of my own experiences on network TV, beyond stereotyped caricatures. In the most recent episode of “Fresh Off the Boat” called “Ride the Tiger,” which aired February 6, the Huang family is celebrating Lunar New Year. What makes this episode so special is that more than fifty percent of the dialogue is in Mandarin, because the family is having a contest at the dinner table to see who can last the longest speaking only Mandarin. 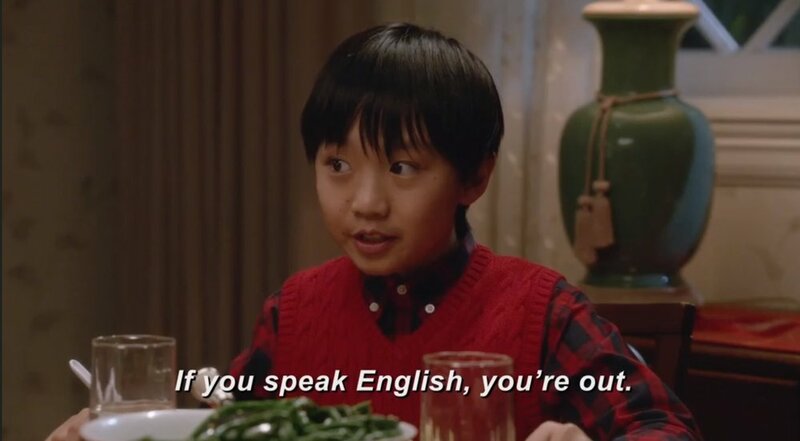 This episode feels powerful and riskier than other “Fresh Off the Boat” episodes, because it covers difficult and nuanced topics such as tokenism, racism and what it feels like to be connected (or disconnected) through language all while having Mandarin dialogue. Adding Mandarin to the dialogue allows for a scene that reflects how some people act like they’re culturally aware when in reality their actions reflect ignorance, an idea the show has tackled before. In “Ride the Tiger,” Deidre, the neighborhood mean girl, says “Gong Hei Fat Choy,” a Cantonese New Year’s phrase, to Jessica Huang (Constance Wu) and her youngest son Evan (Ian Chen). Deidre thinks she’s correct despite Jessica and Evan’s faces of disapproval, and when Jessica tells her in Mandarin that her family doesn’t speak Cantonese, Deidre responds, “Thanks Jessica, for your traditional Chinese response to my well wishes.” So many people of color have experienced moments where another person makes themselves the expert about a different culture, instead of listening to the person actually from that culture. This episode really captured how such a small moment has complex implications. Another reason why this episode stuck out to me was how relatable it was, not just for Chinese Americans but perhaps other people of color or immigrants. In fact, in a Hollywood Reporter post explaining why “Ride the Tiger” used so much Mandarin, the episode’s writer Jeff Chiang, says, “It’s amazing that the specificity of [these] stories can be found entertaining by a network TV-sized audience, many of whom didn’t grow up in a Chinese household.” He’s right, too — I’ve watched many episodes of “Fresh Off the Boat” with an Indian American friend of mine, who relates to as many scenes as I do. When the family is speaking Chinese around the dinner table, it’s a moment that a lot of people who grow up in immigrant households can relate to. The scene becomes even more relatable when Eddie is limited to the same Mandarin phrase and doesn’t know how to ask for dumplings, which is a struggle bilingual people go through when they’re stronger in one language over the other. Last, even though the episode may be in a language many viewers don’t understand, I love that the content of what the characters are saying is so everyday and normal. Most of the Mandarin in the episode comes from Evan and Jessica bickering over who’s going to lose their Mandarin contest. Moments like that, when family members argue over little things and let their competitive streaks come out, are significant because of how ordinary they are. It’s not an overly dramatic or exoticized portrayal, which is exactly what we need. For too long, Asian Americans have been shown in the media as “other,” but “Ride the Tiger” instead shows how relatable these characters’ lives are, despite knowing a second language. Chiang says he wrote an episode that has fifty percent Mandarin dialogue because he could, and I hope other writers take note and follow suit, as long as it’s in an authentic manner.